When you think your teeth are on the way out, it can be tempting to ignore the fact that you are soon going to have gaps in your smile. However, the best time to get replacement teeth is as soon as possible after yours come out. Here at Implant & Ceramic Dental Studios, we can make sure that you spend as little time as possible with gaps. You may be trying to decide what to replace those lost teeth with. Today, most people’s first choice is to have dental implants in Gloucestershire. 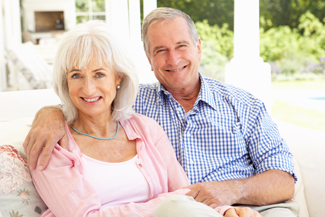 When you have dental implants in Gloucestershire fitted, you can expect them to last for years and years. There is a 96% success rate with dental implants. The implant itself goes into the jawbone and this can last for decades if you look after it well. If you are having dental implants fitted at a youngish age, then you may need to get the porcelain crowns replaced after some years, as they do wear out over time. This is far less often than how long dentures or fixed bridgework lasts. Because dental implants are inserted into the jawbone, where they fuse with the bone tissue, you get a very stable restoration. You get your full biting and chewing power back and so you can eat whatever takes your fancy instead of having to exclude some foods because they are too chewy or sticky. Also, because the implants go into the jaw, there is no plate to cover your palate and mask your taste buds. Dental implant supported teeth stay still. When you talk, laugh, cough, yawn or shout, you never have to worry that your dental implants will wobble or slide around. It’s just not going to happen. To find out more about dental implants in Gloucestershire, do call for a chat or book a consultation with us.